Hi folks, I’m back in blogland again after my break. I have’nt been near the computer in 3 weeks. No blog, email, Facebook, Twitter or checking out all the wonderful and inspiring blogs out there. I have to say I enjoyed the break, the world did’nt end and I had no withdrawal symptoms. But hey, I’m back and the weather here in Ireland is fab. Hurrah!! The Sun has been shining since daybreak. I took these pictures at about 8.30 when I went to open the polytunnel. There’s no going in there later when it gets to 25c. The fields are filled with golden Buttercups right now…beautiful! and the promise of many more to come. 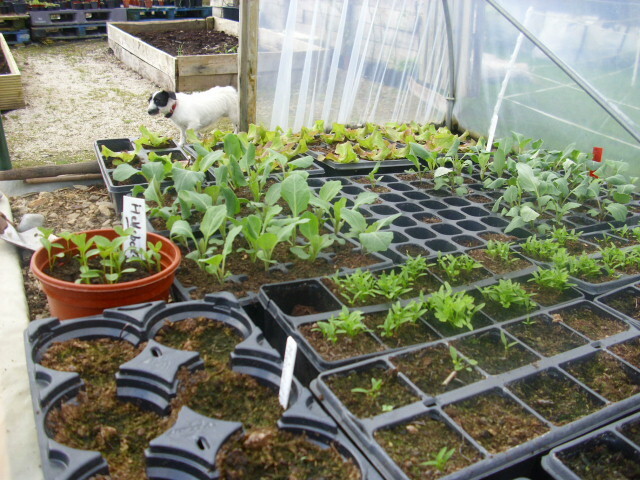 Everything in the polytunnel is growing at a great rate, lots of Lettuce for the salads we have everyday. Nasturtiums in flower as are Pot Marigold. 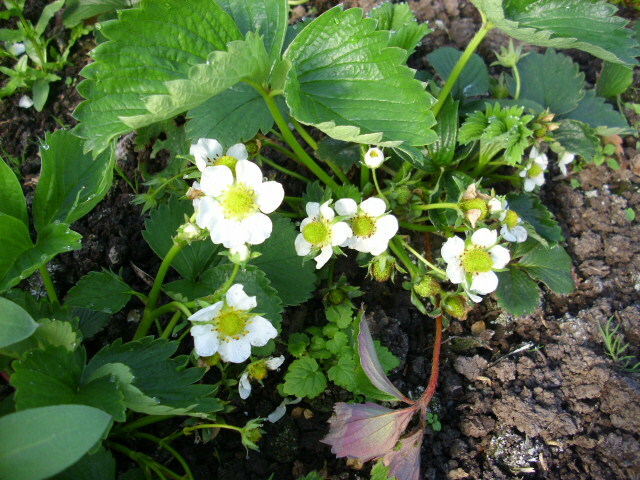 Dual purpose plants as they draw in beneficial insects as well as being edible. The Peach has set lots of fruit…I really must thin them this year. Thinning ensures you get nice big fruits of better quality. Take out any fruits that are touching each other as they will end up squashing and bruising each other. 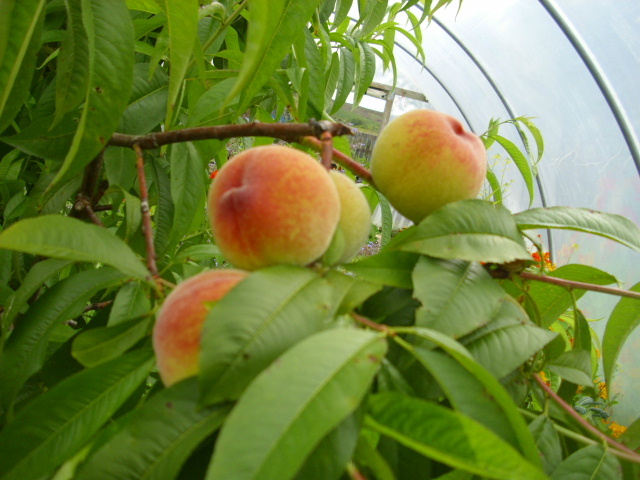 Bob Flowerdew in his Grow your Own, Eat your Own book says ” Peaches over crop as of right, and really must be ruthlessly thinned so that no 2 fruits will touch each other when they’re full size, leave only a sensible number per tree or you will be processing masses of under-ripe squits. Too many exhaust the tree, fail to reach any size or even ripen. Literally decimate them down to the best one in every ten, leave those and they will get huge!” Don’t know if I can be that ruthless…but I’ll try! Bye for now…off to enjoy some sunshine. On Butterflies and garden progress. 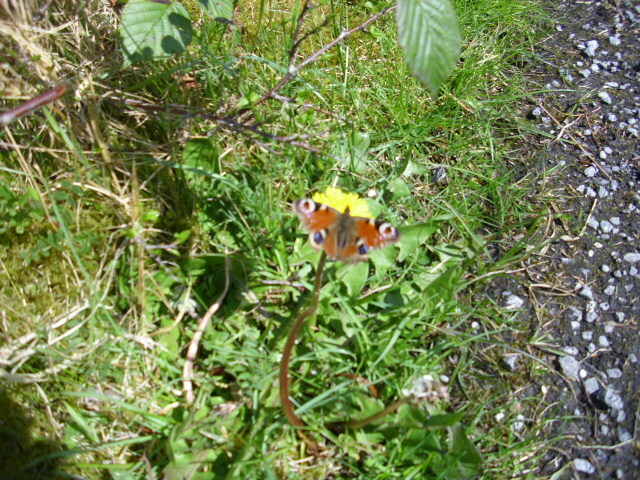 The Peacock Butterflies are out of hibernation now, I saw this one on the lane drinking from a Dandelion. Could’nt get close enough for a better photo, it took several attempts to get this one. It is a bit better if you click on it to enlarge. The favoured place for Peacocks to lay their eggs is on Nettles so if you have a patch of Nettles leave them for the Butterflies. They need to be in a sunny spot though. Do of course have the fresh tops for soup…very nutritious and an old remedy for cleansing the blood in Spring. In the garden the Raspberries are at last starting to spread. They were planted 2 years ago and have’nt done much up to now. Thigs are looking good for this year…lots of flower buds. Fresh Raspberries…bliss! In the polytunnel the beds are filling up with transplants. Growth is slow enough as the night’s are still quite cold. With good planning it is possible to have salad crops all year round. 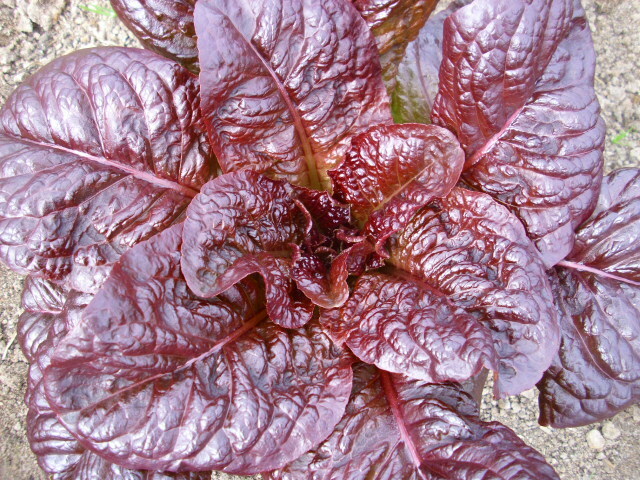 These red Lettuces ready for picking now were planted last August. 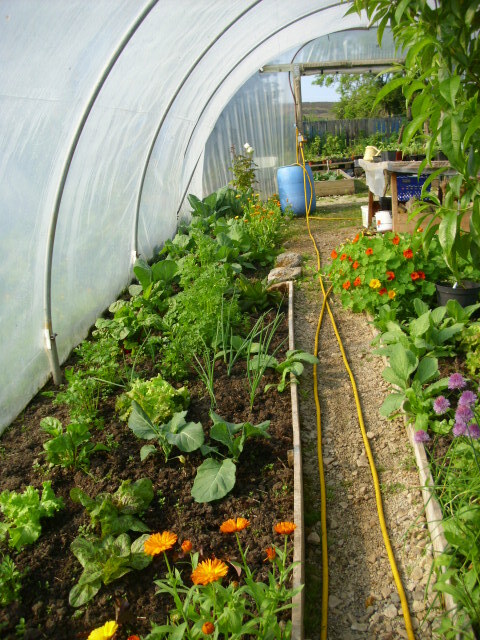 They don’t make much growth over the Winter as our polytunnel is unheated but once Spring comes they take off again. Having fresh salads is a big priority for us as we eat a lot of salad…in all seasons. I never buy supermarket salads as Lettuce is one of the most sprayed crops grown commmercially. I remember reading once that the average Lettuce is sprayed on average 22 times in it’s short forced-grown life. Washing does not remove these poisons…for that is what they are…and then it is eaten raw. 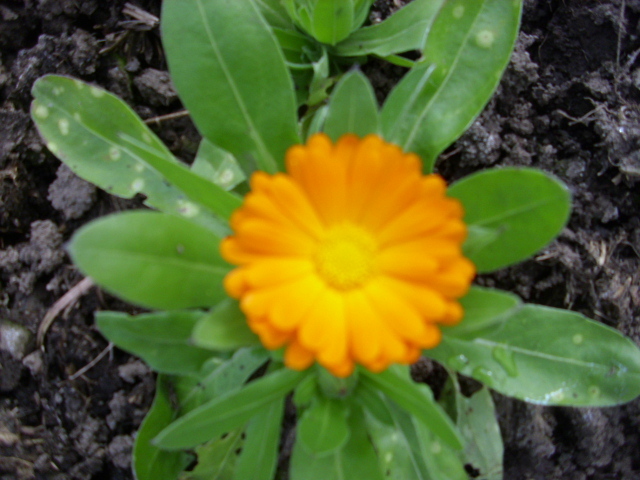 Pot Marigolds or Calendula are flowering early in the polytunnel. I love their cheery faces. The whole plant is edible but I find the leaves a bit coarse so I only use the petals which look lovely decorating a salad. The petals also make a soothing eyewash and a salve can be made can also be made from them. It is very good for cuts, grazes and rashes. A handful of Lettuce leaves and Parsley to make the evening salad…with a nice dressing to accompany it makes a fitting complement to any meal. Topped off of course with a Spring Onion and a scattering of Marigold petals. Art, happiness and Nature’s Bounty on a plate at the end of the day. Perfect! Monday Meanderings from Prospect Cottage. Despite the weather it looks like being a good year for fruit. 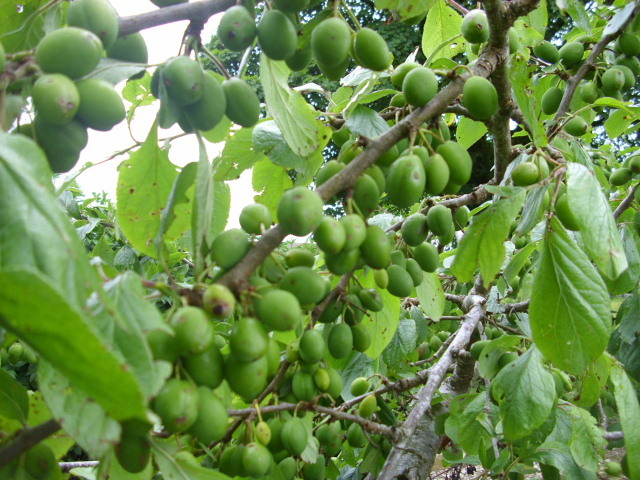 This plum tree, it’s a Victoria, is already laden down. If a drop does’nt occur I shall have to thin out the fruits. Home grown plums are nothing like the horrible shop ones, these never ripen fully and have no great flavour. They are probably irradiated and full of chemicals too. A home grown plum, ripened by the Sun, is a different experience. They have a scent, beautiful flavour and are full of juice. Yum yum, anticipation building! In the polytunnel Peaches have put on a lot of growth. They look inviting already even though they won’t be ripe for some time yet. Lettuce just coming into flower, I really want to save seeds from this one. Don’t know the variety but it’s grown from seeds I got in Bulgaria. It is similar to Little Gem but a lot bigger. 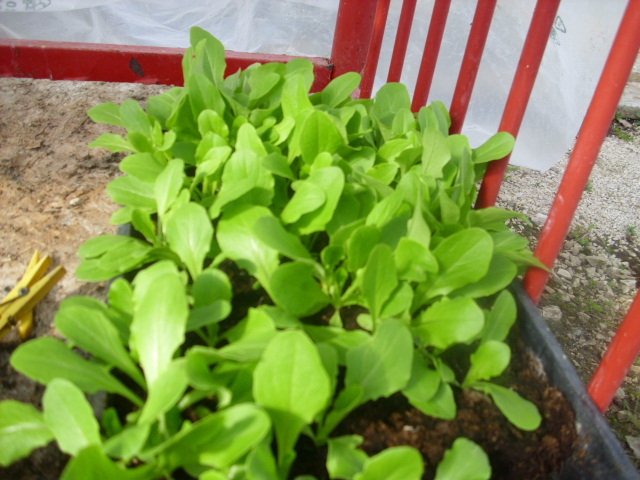 It can be hard to save Lettuce seeds in Ireland’s damp climate. The seeds are tiny and mould has been a problem in the past. The Escallonia has just come into bloom. The flowers are small but there’s loads of them. 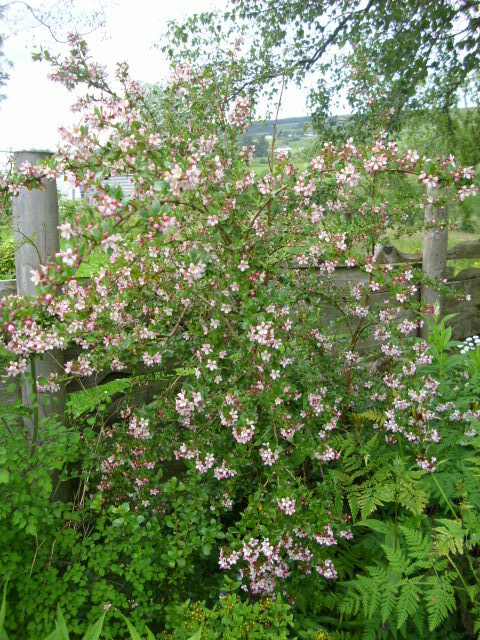 This is a really hardy evergreen shrub which is easily grown from cuttings taken in Summer. The flowers last until early Autumn. Lettuce, Peaches & Nettles @ Prospect Cottage. 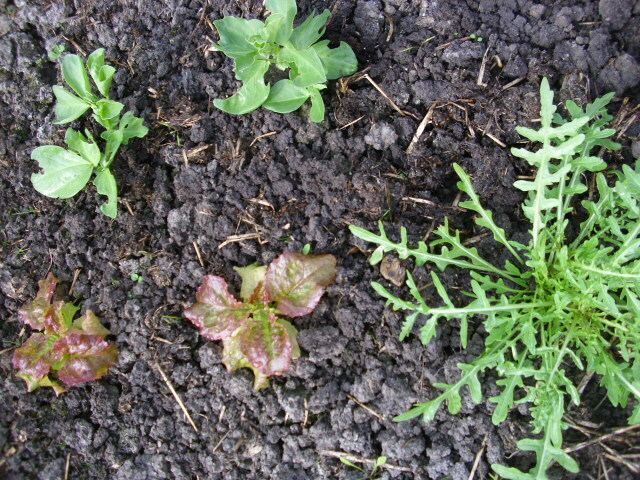 Lots of salad crops at the moment, the Lettuces seem to have formed heads overnight. We eat salad every day at this time of year, the perfect accompaniment to any meal. With a good dressing and some nice brown bread it makes for a complete meal in itself. 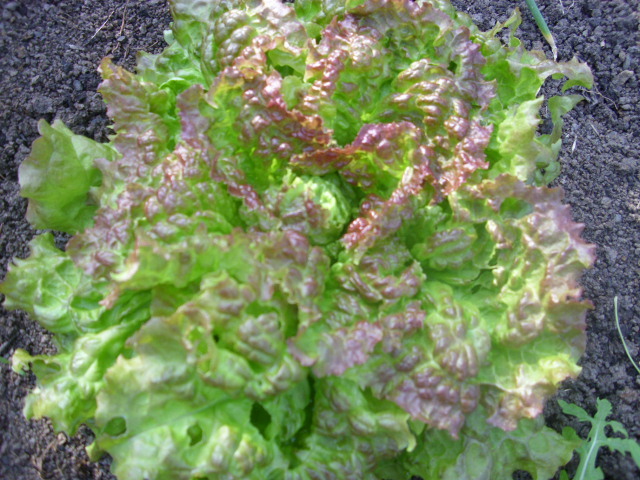 This Rossa de Trento is one of my fave looseleaf lettuces. 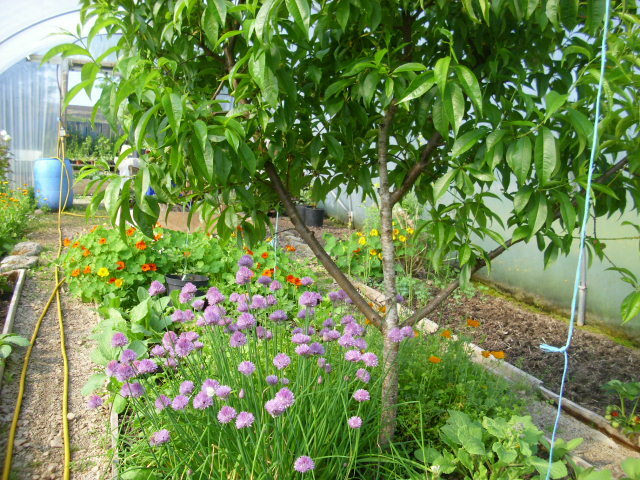 The seed was sourced from Seed Savers in Clare. I am going to try and save seed from this one. Have never had any luck saving Lettuce seed, the weather always seems to turn wet at the crucial time when the seed is almost ready to harvest, seed then gets mould. Will keep on trying. 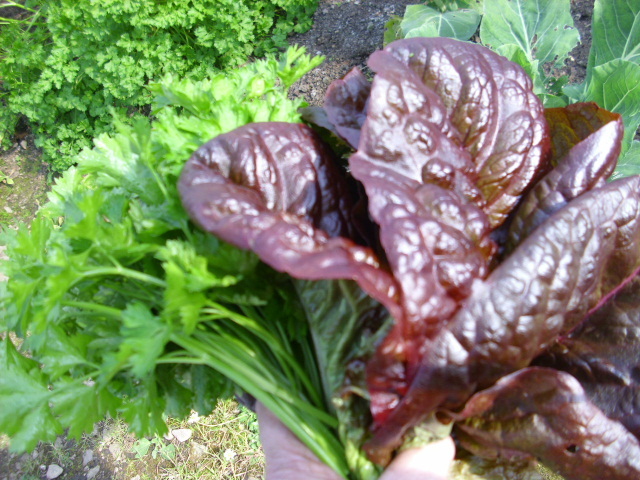 Loose leaf lettuces are great, just keep on picking leaves from them all Summer long. 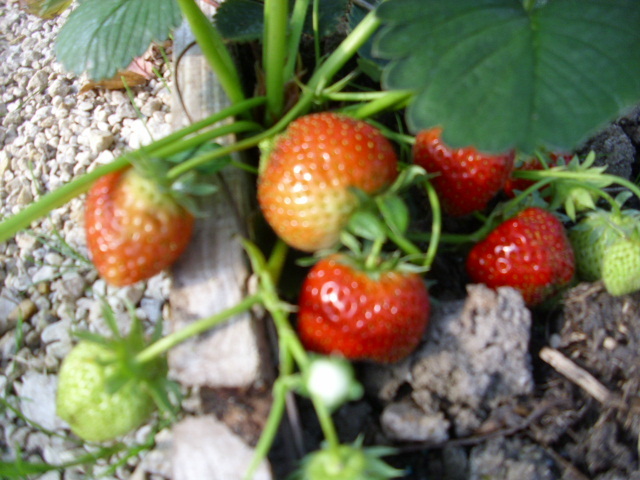 This variety is originally from Italy but it has adapted well to Irish growing conditions. The leaves are redder if grown outdoors. 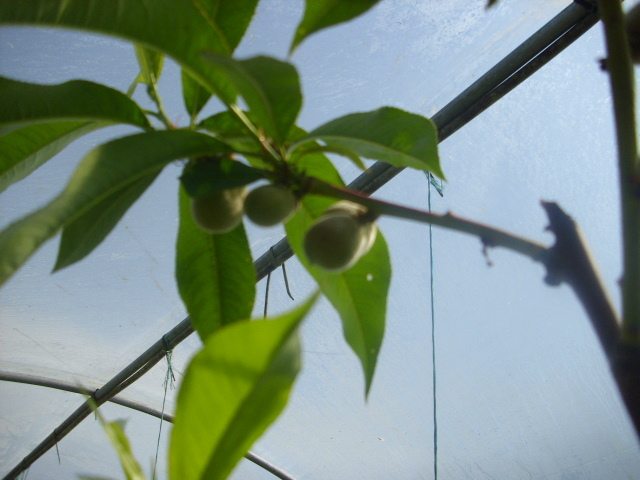 Fruits have set on the Peach tree in the big polytunnel. Not as many as last year but it did get a severe pruning as it was coming close to the polytunnel roof. There is nothing like the joy of eating a home grown peach. Checking each day to see if they are ripe yet, the scent of them, the anticapation, and then the day comes, yeah, BLISS. The Stinging Nettle(Urtica dioica), an important plant for creating bio diversity in the garden. 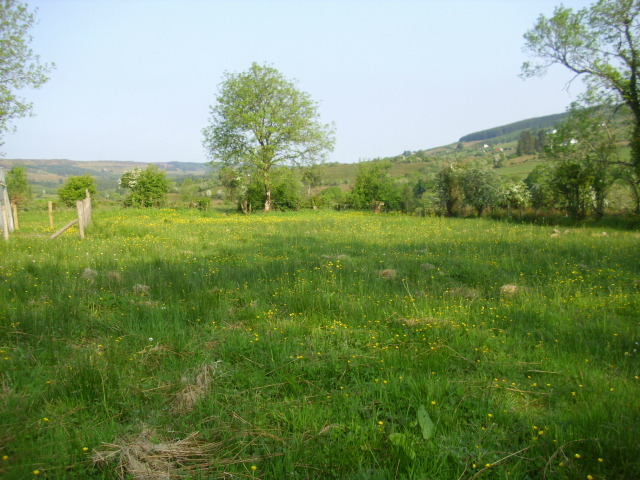 It is host to the larvae of many butterflies, Small Tortoiseshell, Peacock, Red Admiral, Painted Lady and Comma. They can also be used to make liquid fertiliser, on their own or mixed with Comfrey. 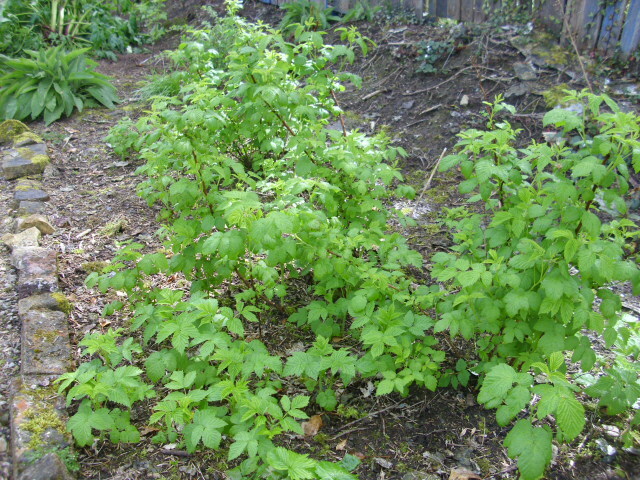 As they contain formic acid they also help to repel pests. 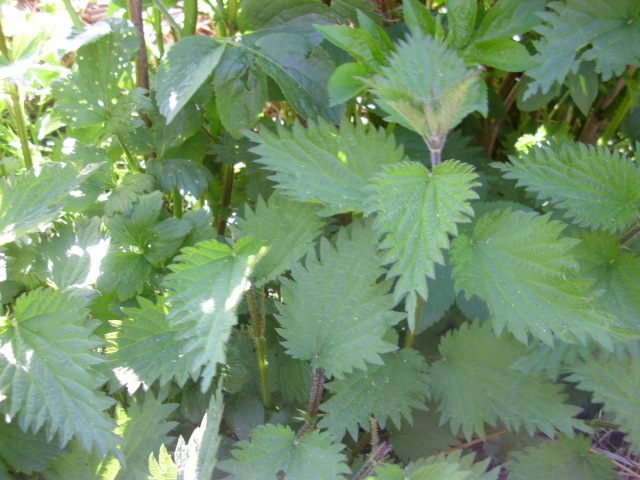 There is an Irish tradition to eat Nettles 3 times in May to cleanse the blood, as the plant is high in vitamins and minerals this old tradition makes sense in the modern age. Nettles can be used to make a tea, not very nice but a teaspoon of honey makes it more palatable. They can also be cooked like Spinach or added to soups, they even make a good beer, have never tried this so I can’t vouch for it. Sanity in the Garden, Madness in the Universe! Is the world gone mad? Irish government is putting aother 25BILLION into saving Irish banks. Madness! Keep the rich people rich. What is rich? For people with a brain cell left it’s not about property portfolios and huge amounts of useless paper printed by Mickey Mouse governments. Of course I know we need some money but if it’s the be all and end all of your life, I consider that a sad and wasted life. For us richness is living in the country, looking after the little bit of the Planet in our care, growing our produce, caring for our animals, respecting other people and their views. Simple living, high thinking. An insight into the current global thought process was given recently by Larry Kudlow, host of a nightly financial programme on American tv channel CNBC. Speaking about the horrific earthquake in Japan he said, “the human toll here looks to be much worse than the economic toll, and we can be grateful for that.” That leaves me speechless, and that does’nt happen often. To save my sanity I will return to garden topics! Growth has really taken off now, lots of planting and pricking out to be done. The Lettuces pictured above are in serious need of moving on, a job for today I think. 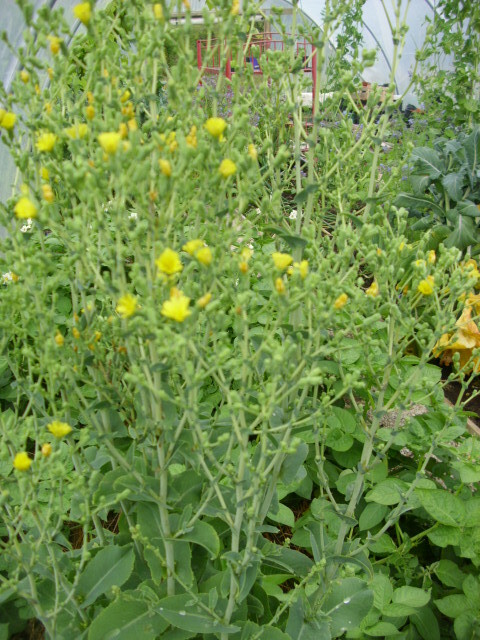 I got the seeds in Bulgaria last year, it is one of the varieties everyone there seems to grow. I don’t know the name but it is a really crisp lettuce with a good flavour, like Little Gem but much bigger. 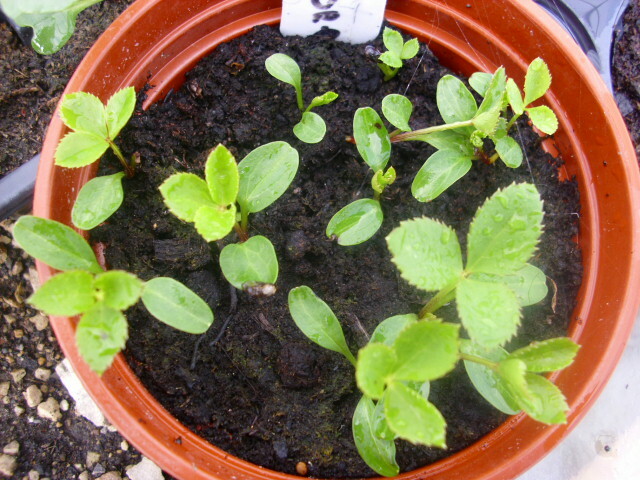 The Hellebore seedlings were planted last Autumn, I had almost given up on them when they emerged. They have put on good growth and I will pot them individually in the coming days. They should be ready for planting out in the Autumn. Hellebores are useful plants, apart from their beauty, they do well in shade and provide early Spring flowers.